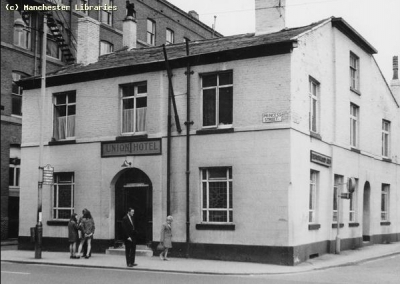 Union Hotel, Princess Street / Canal Street, Manchester, 1970. The Union Hotel was built in 1865 and has been LGBT friendly venue since the 1950s. The bar, which is in the older part of the building, has a pub atmosphere in the day with pool tables and fruit machines. In the evening it is well known for its drag cabaret.